Sometimes, a tooth becomes so decayed or damaged that it simply can’t do its job anymore without some extra fortification. In other cases, an extraction becomes necessary and you’re left with a gap in your smile. As sad as these situations are, there is good news! A dental crown or bridge from Legacy Trails Dental may be able to give you back the winning grin that you’ve been missing. Let’s take a closer look at these treatments and their many advantages. If you suspect you could benefit from any of our restorative dentistry treatments, please get in touch with us. Crowns can be crafted out of various materials, including gold, silver, other metals, and porcelain. Porcelain tends to be the most aesthetically pleasing option because it closely resembles natural teeth. 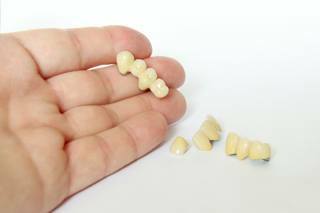 Rather than restore a weakened tooth, a bridge fills in a gap in your smile. It consists of two crowns that fit over the teeth that are next to the empty space. Between the crowns is an artificial tooth (or teeth). Bridges are often made of porcelain or porcelain fused to metal. 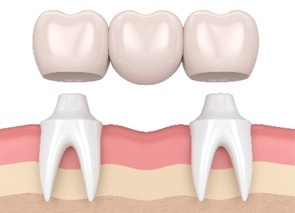 In order for us to install a traditional bridge, we’ll have to remove a bit of enamel from the teeth that are adjacent to the gap, but don’t worry about that too much. Thanks to the crowns that will go over them, those pearly whites will stay strong and functional. Implant-supported bridges are also an option, and they don’t require us to remove enamel from adjacent teeth. With your restored smile, you’ll be able to go back to enjoying all of your favorite foods without worry. Crowns and bridges are strong enough to stand up to the rigors of everyday life. Crowns and bridges present a long-term solution for weakened or missing teeth. They can last for a decade or longer if you care for them well and no unfortunate incidents befall them. A crown can help you avoid an extraction, saving you from the problems that come with missing teeth, such as the possibility that your remaining chompers will drift out of place. A bridge can also prevent drifting by serving as a placeholder in your mouth. Crowns and bridges can prevent problems with your bite, possibly saving you from jaw pain and other complications. We always strive to make our restorations as aesthetically pleasing as possible. Onlookers won’t have to know that you’ve had some work done! Insurance companies are often willing to help cover the cost of crowns and bridges.